At the 2018 Hafenhinterland Conference in Dessau, the city of the Bauhaus, experts discussed the current challenges for the future of the logistics sector. Some 100 logistics experts from six European countries met in Dessau-Roßlau to discuss future-oriented solutions for transport systems in the seaport hinterland. This is an area in which Saxony-Anhalt plays a pioneering role. With the transport of goods by rail, road and inland shipping, the federal state has become one of the most important logistics hubs in Europe. “When it comes to transport, the multimodality of Saxony-Anhalt is unique,” summarised Johannes Jähn, Managing Director of Leipzig/Halle airport and executive spokesman of the company Mitteldeutsche Flughafen AG in his presentation at the third annual Hafenhinterland (Port Hinterland) Conference. The meeting of experts took place under the banner of “Saxony-Anhalt as a multimodal logistics hub.” The Director explained how since the federal state has a central geographic position in Europe, it is able to serve both eastern and western Europe, and is a hub for many key trans-European transport routes. Additionally: “The most-used rail links between China and Western Europe that are currently available go straight through Saxony-Anhalt,” explained Johannes Jähn. That includes transport operations which start in the German ports, particularly Hamburg. Jähn’s vision of developing the region into the European hub for E-commerce was of particular interest, especially since the combined transport terminals in the federal state have plenty of free capacity. There is no doubt that the central German federal state is well equipped when it comes to transport. Goods transporters are able to draw on some 11,000 kilometres of modern roads, 600 kilometres of inland shipping lanes, 18 ports and transhipment points, and with 3,100 kilometres, one of the most highly developed railway networks in the world. This is joined by the most modern train formation depot in Europe and last but not least, the second biggest airport for freight cargo in Germany – and the fifth biggest in the whole of Europe. This means that the federal state has a key position when it comes to the area of logistics. “Three of the six corridors of the trans-European transport networks go straight through Saxony-Anhalt,” explains Thomas Webel, Minister for Regional Development and Transport. Together with the Logistics.Initiative Saxony-Anhalt, his ministry was co-host of the Hafenhinterland Conference in the Bauhaus city of Dessau. 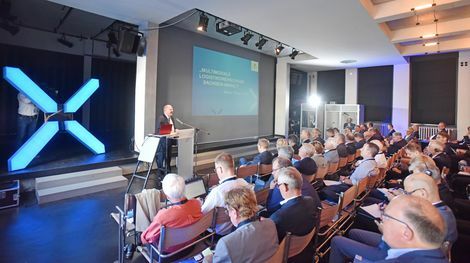 At the specialist forum, 100 logistics experts from six European countries discussed future-oriented solutions for the seaport hinterland transport in Central Germany. “To remain competitive in the future, we will need to change,” explains Under-secretary Peter Lüttjohann, Head of the Unit for Freight Transport and Logistics in the German Federal Ministry of Transport. The current transport forecasts of the Ministry predict considerable changes to take place in the area of goods transport by the year 2030: the transport performance in the area of goods traffic will increase from 607 billion tonne-kilometres in 2010 to almost 840 billion tonne-kilometres in 2030 – an increase of 38 percent! In this respect, Peter Lüttjohann explains that combined transport is set to be by far the fastest-growing segment, expanding by more than 72 percent by 2030. In the current coalition agreement of the German federal government, the Under-secretary is quoted as saying that “We want to ensure the leading position of Germany as a location for the transport of goods and logistics with a Logistics innovation programme for 2030”. Saxony-Anhalt is well prepared for the elevated requirements that apply to logistics. Its favourable trimodal connections have allowed the federal state to become an important logistics hub in Europe. The federal state supported the redevelopment of the railway hubs of Halle, Magdeburg and Stendal with 100 million Euros of financial support. The extension of the A14 motorway to the north is under way, and by 2020, another 15 kilometres of the northern extension are set to be complete. The construction of the A143 – the connection of the A14 motorway in the north with the A38 in the south – has now been agreed. Increasing the capacity for HGV parking lots is also an agreed objective, with 270 more to be added to the existing facilities over the years to come. There is also no lack of initiatives to strengthen the logistics industry either. Back in 2008, the Ministry of Economic Affairs and Transport created the Logistics Advisory Council, which is a binding link between the worlds of business and science and the government. In turn, in the shape of the “ChemMultimodal” project, which was also founded in Saxony-Anhalt, cooperation is under way between chemical companies and companies from the logistics sector. Some 40 chemical companies from all over Europe are currently participating. Their goal is to make a success of moving chemical goods from the roads to inter-modal forms of transport. Saxony-Anhalt also wants to contribute to the protection of the environment with its stated objectives in the areas of decarbonisation and digitisation. The federal state is providing financial support to the construction of connecting sidings in order to strengthen rail freight transport. Transport Minister Thomas Webel, however, still sees considerable potential in the area of inland shipping. The “Elbe master plan”, which was drafted a year ago, aims to strengthen inland shipping. The Minister for Transport describes inland shipping as being “the silent doorway of the modes of transport”. However, the prevention of noise pollution is far from the only advantage offered by shipping. For example, a single tanker barge can transport the same cargo as 82 HGVs or 42 tank wagons. Their range is also unbeatable: with the same amount of fuel, a ship is able to travel 370 kilometres, a train 300 km, an HGV 100 km, and an aeroplane just six kilometres. The logistics sector is currently worth three billion Euros per year, with this turnover being generated by more than 4,000 logistics businesses which have some 50,000 employees. In Saxony-Anhalt, too, there are signs of growth, not least thanks to its connection with the New Silk Road, the logistics initiative of the Chinese government. The Chinese middle class is buying increasing numbers of European products – while China's exports to Europe continue to grow. Airport Director Johannes Jähn highlights the importance of taking the initiative from Asia seriously: “Those that take part are likely to be rewarded with investments. Those that don’t will lose out”. In terms of its infrastructure, Saxony-Anhalt is well-equipped for the initiative, offering optimum links between the different modes of transport. In addition to the train formation depot and freight airport of Leipzig/Halle, Johannes Jähn lists the other advantages offered by the federal state: “The A14 to Hamburg and the A38 connect western Germany and the Benelux countries with the Czech Republic and southern Poland, while the A9 connects Scandinavia with southern Germany, Austria, Italy and Switzerland.” Additionally, the Elbe connects the Port of Hamburg with eastern Germany and the Czech Republic. In the opinion of Johannes Jähn, in the future, shipping is set to play a bigger role due to the increasing volumes of e-commerce goods which would be too expensive to transport by air only. At Leipzig/Halle Airport, research is currently under way into the use of renewable kerosene, another step forwards along the path to reducing pollution from traffic. At the 3rd Hafenhinterland Conference it was clear that there remains a lot to do along the path to achieving an effective and environmentally-friendly future for the world of logistics. But Saxony-Anhalt has certainly made a good start.